The San diu have a population of about 95,000 people inhabiting in the midlands of Quang Ninh, Hai Hung, Ha Bac, Vinh Phu. Bac Thai and Tuyen Quang provinces. They have other names such as San Deo, Trai, Trai Dat and Man quan coc (Man in shorts). San diu language belongs tn the Han Group. 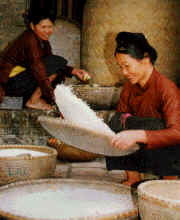 The San diu engage in farming either in submerged fields and on a part of burnt-over land or river banks. They also practice animal husbandry, forest exploitation, fishing, fish-raising, tile-and brick-making, blacksmithing and basketry. For a time immemorial, the San diu manufactured the nowheel quet cart drawn by a buffalo to transport goods. The way of carrying goods by pole uses only when they go to the market. The San diu's daily meals include steamed rice and poridge. They use weak poridge as refreshments. The San diu have gradually adopted the Kinh's wear. It is San diu women's habit to chew betel and always bring with them a segment-shaped cloth bag to contain betel and a small knife to open areca. The bag is embroidered with many colorful motifs and the knife is protected by a wood scabbard engraved with many beautiful figures. The San diu settle in each small hamlet. The house is built level with the ground, the roof is covered with thatch or tile and the walls are built by bricks. Patriarchy is the rule of San diu family. The husband (father) is the head of the family. The children take the family name of the father and only sons have the right of inheritance. The parents decide the marriage of their children. although it still depends on the "examination of age" of the future couple. The funeral is celebrated with many rites. Three years otter the burial, the dead is exhumed to take the remains to bury again in a final tomb. 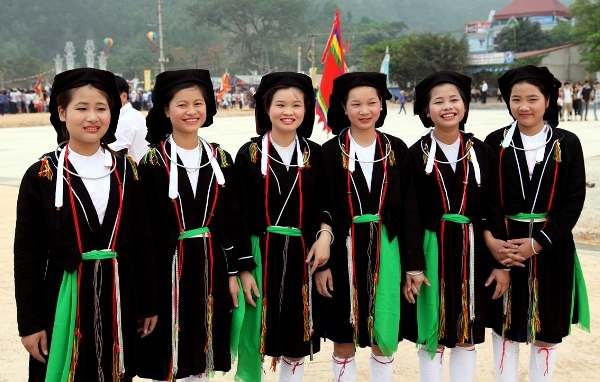 This is also one of the San diu's joyful ceremony. The San diu worship their ancestors, the god of the kitchen, the genie of the earth and even the Goddess of childbirth. In a year, they hold many ceremonies such as before crop, after crop, new rice and rain praying which are related to the production. The San diu also worship Kwan Yin, Three Saints and their group founders.